Reading your horoscope can be fun, but your personality type says far more about who you are than your zodiac sign does. 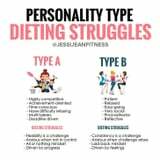 And nutrition and fitness coach Jessi Jean shared why it’s important to understand your personality type when it comes to identifying and overcoming dieting obstacles in particular. Anxious when not in control. Jessi continued to explain how identifying both your strengths and weaknesses and being open to improvement can help you achieve balance. Which personality are you?